Arizona. One of America's hottest and driest states. 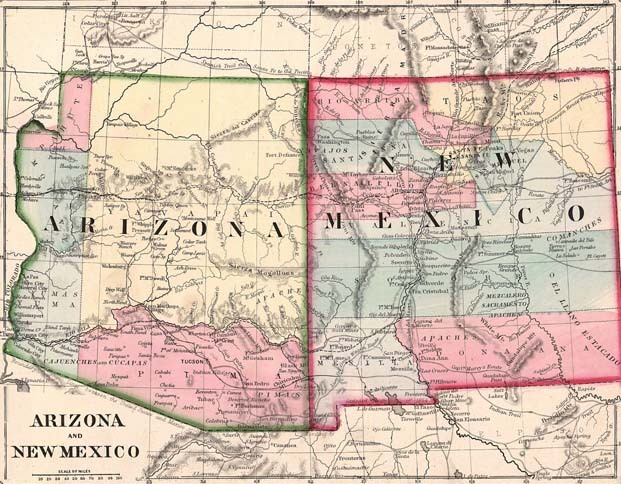 It was born out of the Civil War when the name "Arizona" was first used. Before then, it was part of the Mexican state of Vieja California once Mexico declared independence from Spain in 1822. However, the Spanish was first in Arizona back in the 16th century. Drawn by the presence of valuable metals. Mostly silver. However, Arizona remained largely unpopulated, with the economy not much above subsistence level, and local small mining concerns. The Mexican war of Independence heavily damaged the newly independent Mexico, destroying a lot of its silver mining. This forced Mexico to sell off large swathes of land to try to help pay off its debts. It also allowed large numbers of Americans to start to move into the territory and settle. Farming, and trapping. In 1836 Texas with a largely immigrant population declared its independence from Mexico. Mexico, still weak, ended up losing and Texas gained its independence. It survived as an independent republic for 10 years, backed by the French, British, and Americans. Mexico saw Texas as part of its territory. It was able to 'get by' with Texas as a small republic. Even with Texas pursuing territorial claims. However, in 1846, despite strong objections from Mexico, Texas was annexed by the US. This led to the Mexicans declaring war. The Mexican - American War (1846-48). 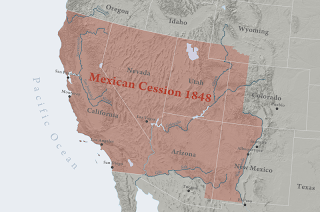 With the Americans marching into Mexico City, they forced the Mexicans to sign the Mexican Cession in 1848. 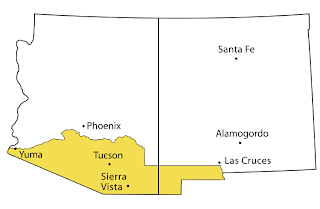 This handed Mexican territories north of the Gila river, and west of the Rio Grande, all the way to California, and north to Oregon. In return, the US paid compensation of $15,000,000 to the Mexican government. The territorial grab was complete in 1853 with the Gadsden Purchase. Gadsden was the American Ambassador to Mexico, and led the negotiations at the time to push the border south. This final purchase gave the US the land that would lead to Arizona and New Mexico. This region joined the US as the Territory of New Mexico. The first time 'Arizona' appeared was during the Civil War. The south of the territory, settled by white farmers with slaves opted to break the south of the Territory of New Mexico from the Union and started the Territory of Arizona within the Confederate States of America. 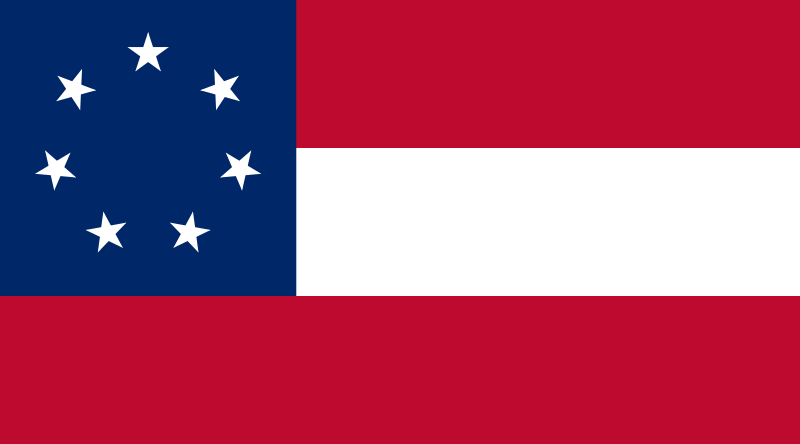 The flag of which became known as the "Stars and Bars." 3 horizontal bars of red, white, and red. A Blue square in the upper hoist, with a circle of 7 stars. However, it was a short-lived state, with the Union recapturing it the following year, and reintegrating it with the Territory of New Mexico. However, 1863 saw a re-birth of Arizona. This time, the Territory of New Mexico was split in two vertically. 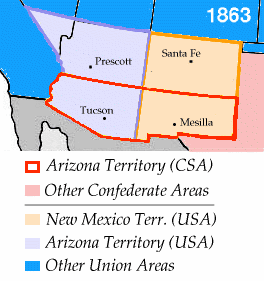 The western half became the Territory of Arizona. Throughout all this, farming and mining remained linchpins to the economy. The First World War drove demands for Arizona's raw materials, only to see the economy devastated by the Great Depression. However, with the advent of the Second World War, Arizona again boomed. 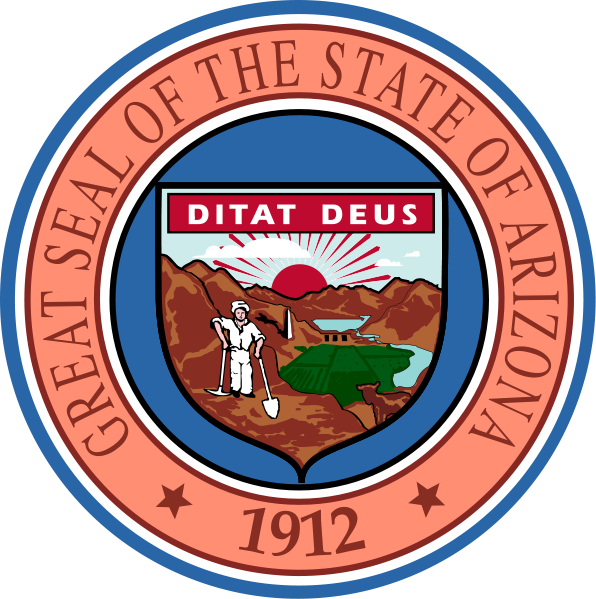 Arizona was admitted to the Union in 1912 as the 48th state. However, it nearly entered the Union as part of a larger State of New Mexico. Many saw this as a plan by the Republicans to maintain a grip on power, with New Mexico being strongly Republican. Whilst those in New Mexico voted strongly in favour of this plan, those in Arizona voted strongly against. This then led to Arizona joining later. 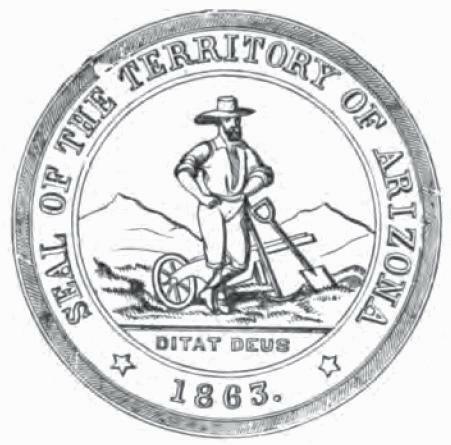 The first seal used to represent Arizona was introduced upon the creation of the first territory of Arizona, in 1863. This featured the text "Seal of the Territory of Arizona," as well as the date, and "Ditat Deus" or "God enriches," the state motto. The seal features a bearded miner standing in front of a wheelbarrow, holding a pick and and a short handled blade. Behind are two bare mountains. However, a new seal was introduced the following year. The new seal kept the text, but changed the images. This new seal featured the San Fransisco peaks, as well as a deer, and cactus. However, it took a long time for the seal to enter into official widespread use. 1879. 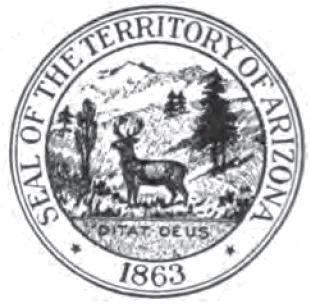 It was in 1910 that the state began the process of introducing a new seal. This process was completed with the admittance of Arizona to the Union. The new Seal features a central shield in which are a mountain range in the background with a rising sun. On the right is a water storage reservoir, with a dam, and irrigated fields. Also on the right is a cow, and on the left is a quartz miner holding a pick and a shovel. This represents the Five C's that are the foundational elements of the economy of Arizona. The cow represents Cattle. The irrigated fields on the left and right represent Citrus and Cotton. Copper is represented by the miner, and Climate by the sun and clouds in the shield. 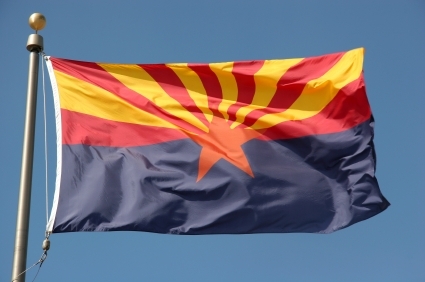 Arizona's flag was first created in 1910 by Colonel Charles W. Harris for the Arizona Rifle Team. This was because up until then, Arizona had been the only team to go to shooting competitions and not have a flagt o march behind. The flag he created was formally adopted in 1917 and became the State Flag. The flag is split into 2 halves. The lower half is blue, the colour of liberty. Placed in the centre of the flag is a copper coloured star. The star represents the state, with the copper colour inspired by the mining industry. Fanning out from the top of the star are 13 rays. These represents the the sunsets of Arizona. There are 13 rays represent the 13 original US states. The rays are coloured red and yellow. The colours of the Spanish flag, who where the original colonists of the area. The blue and red are matched to the blue and red in the US flag. In 2001, the North American Vexillological Association conducted a poll on the top flages in North America. Arizona's flag came out ranking 6th.